One picture does not a negotiation make. With that in mind, when one goes forth into the World representing your company or your country - the nonverbal component of face-to-face meetings and negotiations should never be so sorely overlooked. The above photo was taken recently in Cairo. On the left is Egypt's interim Vice President Mohamed ElBaradei, in the center is U.S. envoy William Burns and on the right is EU representative Bernardino Leon. The Egyptian V.P. is seated alone in the power position. Both of his feet are planted firmly on the floor - as is his political position. His legs are wisely moderately separated - however not too widely. Those men who sit with their legs widely splayed (in the seated crotch display) are often trying to overly-express their alpha qualities. Such body language projects over-compensatory behavior and can backfire. The American and European diplomats are seated with their legs in a configuration of the opposite extreme. William Burns in particular is transmitting a message of weakness. With his knees nearly knocking, Burns is gripping his left hand beneath his right thigh. This body language cluster is screaming weakness and low confidence. Such beta behavior is seen upon the receipt of bad news or when a person feels they are backed into a corner. It is a natural position of low strength and heightened protection. Additionally, when a man assumes this combination of nonverbals it has the extra meaning of projecting an effeminate emotional tone. Hands should never held in the lap or protecting the groin when negotiating or when trying to deal from a position of power. 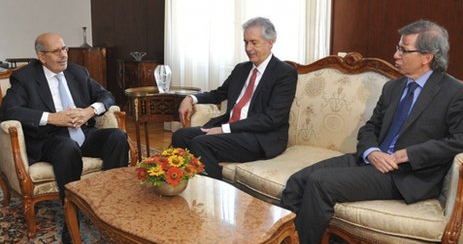 What is the difference in the nonverbal message that Mr. Leon hands are sending vs. those of Mr. ElBaradei? If those whom with you are negotiating assume a position similar to that of William Burns - you will know you have already won. Leadership Body Language Secret # 103: High Confidence vs. Low Confidence Stance - Who's Leading Who?